The 931st Guards Separate Reconnaissance Aviation Regiment (OGRAP) trace its roots back to the Great Patriotic War, when the unit from which the regiment inherited its traditions distinguished itself within the 16.VA. It received its "Prazhskiy" honorific name after the tank battle that took place in the Warsaw suburbs (at Praga or Prazhskiy in Russian) between July and September 1944. This unit was then called the 98th Separate (Artillery) Correction-Reconnaissance Aviation Regiment (OKRAP). 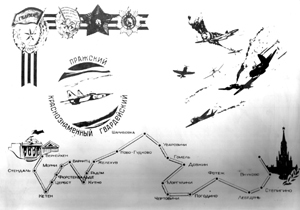 The regiment became the 931.OKRAP in January 1949 and the 931.ORAP in 1953. As for its Guards title, it was inherited in 1968 probably from one of the founder squadrons of the 98.OKRAP that received this honorific. The 98.OKRAP ended the war at Zerbst in 1945 and remained there until July 1947, flying among other aircraft types the Polikarpov Po-2. Köthen became the unit's second German base and it remained there until 1951 or 1958. The Po-2 would have been replaced there in 1948 in favor of Yakovlev Yak-3 - although that information remains to be verified and justified. The regiment then moved to Stendal where it stayed until 1968. Il-28R reconnaissance aircraft were delivered from 1953 on. In 1968, the "Beagle" were moved to Werneuchen (1) where they continued to fly together with Yak-27R "Mangrove." The latter were taken on charge in 1966 and retired in 1969. Yak-28R "Brewer-D" also were delivered in 1968 (for a description of the IL-28R, Yak-27R and Yak-28R, refer to the first page about the 11.ORAP). 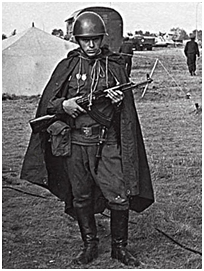 In August 1968, the unit actively took part to operation "Danube" - the invasion of Czechoslovakia. According to Sergeant Evald Ye. 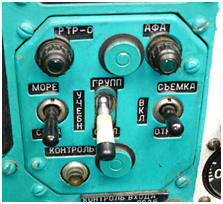 Kuznetsov, a 931.OGRAP mechanic who specialized in aircraft electrical equipment, Yak-27R were deployed at Černovice. That is probably an error because the airfield at Brno-Černovice had a grass runway with a limited infrastructure. The Czechoslovak 24th Helicopter Regiment (VRP) equipped with Mi-4 and a handful of Mi-1 was based there. Heavy maintenance on a Yak-27R of the 931.OGRAP during operation "Dunay." © E.E.Kuznetsov. Le sergent Kouznetsov monte la garde devant la ligne de vol du 931.OGRAP à Hradčany. © E.E.Kouznetsov. 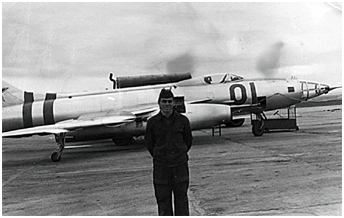 Sergeant Kuznetsov stands guard in front of the 931.OGRAP flight line at Hradčany. © E.E.Kuznetsov. Moreover, Ye. Kuznetsov mentioned the presence of a fighter regiment (MiG-19 and MiG-21 - Czech sources mention forty MiG-21 of the 833.IAP from Altes Lager) and a transport regiment (An-8 and An-24 - others testify about the presence of An-12 and Mi-6) also were deployed at the same airbase. It is therefore very likely that some planes or possibly every aircraft of the 931.OGRAP (2) were sent to Mimoň-Hradčany airfield as some sources state. In any event, this airfield was located in the occupation area assigned to the Central Front that included the East German and GSFG forces. The regiment's Yak-27R were adorned with the same red stripes that were applied to all Soviet aircraft involved in the operation. They flew photo missions to map almost all of the country, as well as reconnaissance flights to locate the columns of the Czechoslovak People's Army and report their position to command centers. The USMLM annual report for 1968 mentioned: "On 28 October MANGROVEs returned to Werneuchen from an apparent supporting role in the Czechoslovakian invation." The Il-28R finally were withdrawn from service in 1972, leaving the first and second squadrons fully equipped with Yak-28R "Brewer-D" and, of course, some Yak-28U "Maestro." However, it seems obvious that the 931.OGRAP also used some less-conventional aircraft like the Yak-28LR "Brewer-B" shown above and below right. 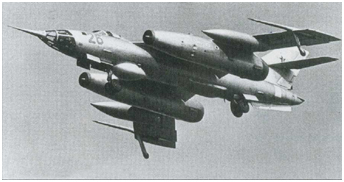 The Yak-28L was a tactical bomber, but there are several photographs showing GSFG Yak-28L with RR8311-100 pods hung under the wings instead of additional fuel tanks. These pods, intended for measuring the levels of radioactivity in the air, originally were designed for the Yak-28R. However, they were adapted to various aircraft types including the Yak-28L. A Yak-28L thus equipped probably took the designation Yak-28LR or RL. But why was this type of aircraft used for these missions rather than the Yak-28R (then designated Yak-28RR)? This ground-attack aircraft was equipped with a "Lotos" (Lotus) targeting system using radio command guidance from two ground control stations. However, the efficiency of the complex left something to be desired for various reasons (reliability, complexity, vulnerability to countermeasures...). Thus, the decision to assign a few aircraft that have fallen out of favor to reconnaissance units to ensure radiological reconnaissance missions always could be undertaken. Let's go back to the photo of the Yak-28LR bort number 05 shown above right. Yak-28R of the 931.OGRAP can be seen on the same flightline and what appears to be a Yak-28I bomber carrying the bort number 24. What was it doing there, parked between two Yak-28R? If we exclude the simplest explanation, namely that it was just a visitor, there is another interesting hypothesis. According to this > link about 50 Yak-28Is were converted to Yak-28BI by the addition of a "Bulat" (Sword) side-looking mapping radar mounted in the bomb bay. Was it such an aircraft? Its assignment to a reconnaissance unit would have been logical. The unit received MiG-25RB reconnaissance aircraft during the mid-seventies. 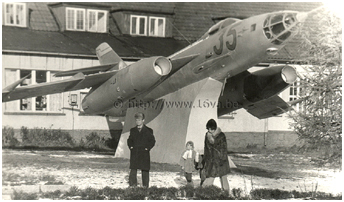 With the arrival at Werneuchen of the first "Foxbat-B" aircraft in November 1974 (3) (see > "Let's go get Foxbat! "), the regiment prepared itself to employ a new extraordinary reconnaissance platform that was virtually invulnerable - simply put, there were no aircraft or missiles capable of shooting down such an aircraft at that time. We also will remember the turmoil caused by the repeated and unpunished overflights of Israel by four MiG-25R and RB detached to Cairo in 1971-72. The 931.OGRAP was the only unit flying MiG-25 in the GDR at that time - it was not until 1981 that the 787.IAP from Finow received MiG-25PD interceptors to counter the US Lockheed SR-71 (see > "The fighters"). The MiG-25RB and their variants also had a significant air-to-ground capacity - Werneuchen aircraft often were observed fitted with multiple-ejector bomb racks. 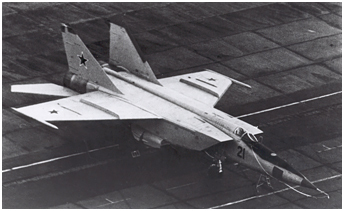 Thanks to a Peleng-D and -DR (Bearing) integrated navigation complex comprising an Orbita-10-155 digital computer, an ANIS-8 inertial navigation system and a DISS-3S Doppler velocity and drift meter, the MiG-25 were able to bomb in automatic mode (4) targets with known geographic coordinates at a range of 560 km; moreover, this was done at supersonic speed from the stratosphere. However, the Orbita-10-155 digital computer of the early Peleng versions suffered from reliability problems. The situation gradually improved with the introduction of the "DM" model and finally the Peleng-2 that was the best variant. 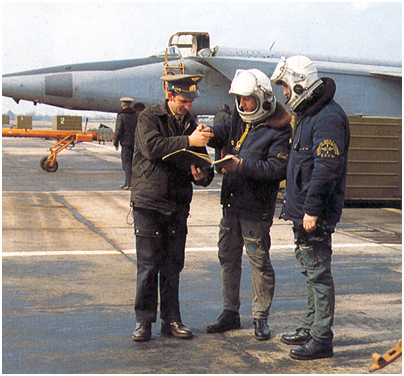 Two pilots of the 931.OGRAP wearing a vice adorned with a stratospheric flight suit in front of a MiG-25RB photo reconnaissance variant. © Molodaya Gvardiya. During a standard bombing mission and without going into details, the MiG-25RB automatically followed the correct course after takeoff; the pilot received a signal in time to pull the trigger that would allow the dropping of bombs in automatic mode. The return flight to home base or to one of two pre-programmed reserve airfields also could be performed in automatic mode. It should be emphasized that, in order to withstand a supersonic flight regime, the bombs had to be an adapted variant able to withstand a temperature of 300°C as did the aircraft airframe. The maximum bomb load with FAB-250M-62T or FAB-500M-62T and AT (T for Termostoykaya - heat-resistant) varied depending on the MiG-25 version (5). A bomb dropped from an altitude of 20 km at a speed of Mach 2.35 (2500 km/h) reached its target at a range of 38.8 km after a ballistic trajectory lasting 76 seconds. A 500-kg bomb exploding at impact caused a crater 2.5 meters deep with a diameter of 4.5 meters; the shrapnel burst covered a radius of 870 meters. When the explosion was delayed for 26 seconds, it caused a crater 2.7 meters deep with a larger diameter of 12.5 meters. The radius of destruction was reduced to 435 meters. An impact within 800 meters from the target was considered good with the Peleng-DM. This figure was cut in half with the Peleng-2. Everything depended on the nature of the target (for exemple an oil complex as was the case during the Iran-Iraq war) and the intensity of the bombardment. Oleg Kozlov, a Yak-28PP pilot of the 2.AE from the 931.OGRAP, declared: "While maintaining radio silence, there were several training flights over the Belorussian SSR. 500-kg dummy bombs were dropped from an altitude of 20 km over the Luninets Bomb Range." A French intelligence officer assigned to the listening services at Berlin during the mid-80s who wants to remain anonymous gave us the following additional details: "The aircraft climbed to an altitude of 20,000 meters and accelerated to supersonic regime. It followed the standard navigation route n°50 for Werneuchen. Bomb drop (apparently simulated) took place at a range of 80 kilometers [probably an error here: the range should be 40 km] from the potential target and was announced by the pilot under the term "grom" (thunder) - the term "sbros" (drop) also was used. The MiG-25 pilots from Werneuchen practiced this training day and night on each flying day (Tuesday, Thursday and Saturday)." The MiG-25 of the 931.OGRAP also would have been tactical nuclear bombers (see > "Special weapons"). However, the flight profile and type of bomb(s) the MiG-25 would have employed to perform their special missions have not yet been determined and confirmed. Although only one squadron was flying the MiG-25 (the second squadron continued to fly the Yak-28R - the latter were replaced by Yak-28PP in 1986), the 931.OGRAP was nevertheless equipped with at least six different "Foxbat" variants. The last order of battle of the 1.AE in 1991, right before its transfer to the 11.ORAP at Welzow, comprised 2 MiG-25RU "Foxbat-C" twin-seaters and 14 single-seaters, including MiG-25RBV and RBT "Foxbat-B" equipped with electro-optical reconnaissance systems and MiG-25RBS, RBSh and RBF "Foxbat-D" equipped only with electronic reconnaissance systems (6). The MiG-25 reconnaissace aircraft family was divided into two distinct branches: first, the aircraft equipped with cameras and an ELINT system and, second, those only equipped with an electronic reconnaissance suite. The first operational variant of the reconnaissance "Foxbat" was the MiG-25R "Foxbat-B" or Article 02 (Izdeliye 02), the production of which started in 1969 at Gor'kiy - today Nizhny Novgorod. This aircraft was equipped with cameras and a Romb-4 (Diamond) ELINT suite; however it was devoid of offensive capabilities. The next, more-advanced version, was the MiG-25RB "Foxbat-B" (Razvedchik Bombardirovshchik - Reconnaissance Bombardment) or Article 02B, manufactured between 1970 and 1972 at Gor'kiy. Besides their cameras, these aircraft used a SRS-4A, -4B or -4C Romb-4 ELINT system - each version of the complex covered different frequency bands. These aircraft were protected against acquisition and guidance radars by an SPS-141 Siren' (Lilac) deception system and also were equipped with an SPO-10 radar homing and warning receiver (RHWR). Around 1971, a new and more efficient ELINT suite designated SRS-9 Virazh (Turn) began to be series produced. That new complex was mounted in new MiG-25RB airframes in lieu of the older Romb system. Thus, these new aircraft were designated MiG-25RBV or Article 02V. From that version on, a third letter identifying the onboard ELINT suite was added to the designation of the MiG-25RB variants, in this case V for Virazh. The Virazh-1M had a broader radar detection spectrum. It covered a 450-km wide strip of land on each side of the aircraft (900 km in total); however, a 70-km wide area located right under the aircraft could not be covered. The different types of radar were identified and localized with an accuracy of 30 to 50 km. 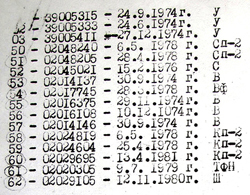 Data were recorded on magnetic tape and processed on the ground by the OOI (Otdelniye Obrabotki Informatsii - Information Processing Branch; besides ELINT information, the latter also processed pictures). The SPO-10 RHAWR no longer was mounted on the MiG-25RBV version. It seems almost certain that this "Foxbat" version was the first one accepted by the 931.OGRAP in 1974. About 1978-79, some MiG-25RBV were upgraded to MiG-25RBT standards (Article 02T). This new version of the "Foxbat-B" was outwardly similar in all respects to the MiG-25RBV; however, the Virazh ELINT suite was replaced by the SRS-13 Tangazh complex. This new suite had an even wider radar detection spectrum and the transmitters localization was improved to 10 - 30 km. The area coverage remained of 900 km and the data were always recorded on magnetic tape for analysis on the ground. 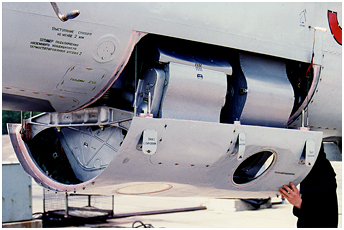 This system also was found in pods carried under the belly of the Su-24MR from the 11.ORAP and it also was part of the MiG-25BM internal equipment. The RBT version was equipped with the Parol IFF system, the Sirena-3M (Mermaid) radar warning receiver - that was later replaced by the SPO-15 Bereza (Birch ) in 1980 - and the SPS-141 Siren' deception system. Moreover, the MiG-25RBT were normally retrofitted with the Peleng-2 navigation complex. #1: Standard reconnaissance (VFR conditions with light cloud cover) - four oblique 70mm A-70M cameras housed in the main removable compartment and a 130mm A-Ye/10 camera for topographical work, positioned just under the cockpit. The latter covered a corridor up to 10 to 15 km wide directly under the aircraft, and the A-70M expanded the coverage up to 100 km. In any configuration, the Peleng navigation complex automatically triggered the cameras at the programmed coordinates and a FK-5 camera took pictures of the coordinates where the different shots were taken. A SU5 exposure meter also was part of the standard equipment. This was the most common configuration. Such an aircraft had the standard nose with a porthole under the cockpit (A-Ye/10 camera) and four portholes (two obliques offset on each side of the nose and two more offset under the nose) for as many A-70M cameras. During daylight, high quality photographs could be obtained from an altitude of up to 22,000 meters. #2: Detailed reconnaissances: two 150mm A-72 cameras in the main compartment (probably sometimes with only two portholes) and one A/Ye-10 camera, plus a FK-5 camera and a SU5 exposure meter. #3: Night (and day) reconnaissance: two NAFA-MK-75 (NA-75) cameras under the nose that in this case would sometimes have only two portholes and a FK-5 camera. A 15 km wide strip of land could be photographed under VFR conditions. Flare bombs were dropped by the MiG-25 to illuminate the ground when taking pictures (maximum speed was restricted to Mach 2.2 with flare bombs - up to eight FOTAB-100-140). 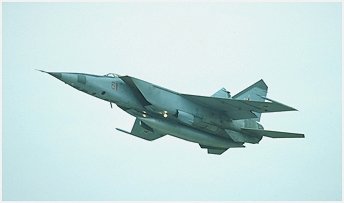 A MiG-25RBN version for night reconnaissance sometimes has been mentioned; however, former VVS personnel categorically refute this information. The technical documentation of aircraft bort number 55 of the 931.OGRAP that was equipped with a night photo reconnaissance suite (according to its nose configuration and its construction number) indicated that it was a MiG-25RBV variant. Distribution of different MiG-25RB variants within regiments was based on the specific tasks assigned to each regiment. It is possible that some aircraft had different pre-programmed routes loaded (before the flight) in their Peleng navigation complex (e.g., to perform ELINT collection mission or use a SLAR along the inner German border) and that they carried ELINT equipment targetting specific frequency bands for these particular missions. As was the case for most aircraft designed for reconnaissance, the "Foxbat-B" and "-D" had no gun or missiles to defend themselves against enemy fighters. Their pilots had to count on their maximum speed of Mach 2.83 (7) - three times the speed of sound - and on their 24,000 meters maximal ceiling to escape an attacker that would have had a hard time to reach them. (1) The 931.OGRAP filled the void left by the departure of the 132.BAD Headquarters and the 63.BAP that was subordinated to it. The 132.BAD also controlled the 668.BAP at Brand and the 277.BAP at Finow. These regiments were then equipped with various versions of the Yak-28 "Brewer" tactical bomber. The aircraft from Werneuchen and Brand left the GDR in 1968 and those based at Finow in 1970. (2) The testimony of a former BRIXMIS officer mentioned the movement of complete ground units, including disabled vehicles being towed, as in time of war, leaving barracks completely deserted. 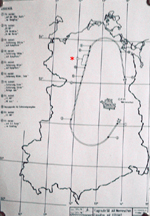 (3) The close proximity of Werneuchen to the city of Berlin provoked some near-misses. Thus, on June 18, 1977, October 5, 1978 and 21 October, 1980, British Airways BAC 1-11 (One-Eleven) airliners on approach to Berlin-Tegel Airport avoided the risk of collision with MiG-25 taking off from Werneuchen. 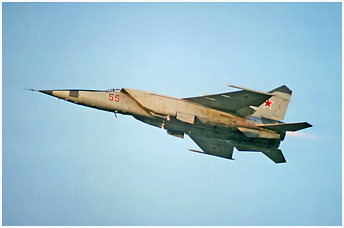 (4) MiG-25RB of which the production began in 1970, were the first bombers without a bomb sight. (5) The MiG-25RB, RBV, RBK and RBS could initially be equipped with four MBDZ-U2 bomb racks (two under the fuselage and two under the wings, with two bombs hung side by side under each MBDZ-U2) for a total of four tons of bombs. 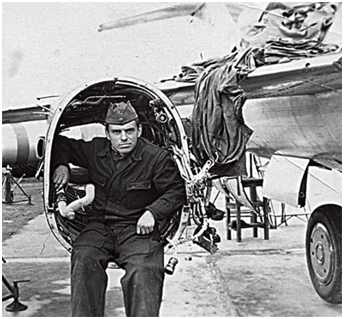 However, the maximum load was quickly limited to two tons of bombs attached under the fuselage due to the stress on the airframe. The simple adoption of modified MBDZ-U2TK bomb racks for the wings made it possible to lift this restriction. 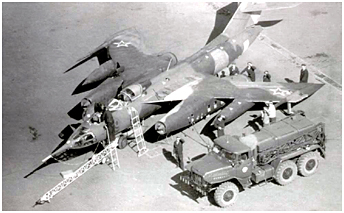 Hanging the bombs in tandem under the new racks and also use of a different drop sequence were enough to allow a four-ton bomb load. MiG-25RBT, RBSh and RBF could carry five tons of bombs thanks to a third MBDZ-U2 attached under the fuselage. (7) A speed of Mach 2.65 to 2.85 could be sustained for up to five minutes. Before March 1991, the reactors were pushed up to Mach 2.65 when tested (subsequently reduced to 2.35 after an accident at the maintenance center in Rzhev). Authorization from the MiG OKB was necessary for flights at speeds above Mach 2.65. A standard flight was as follows: Take off, acceleration up to 1000 km/h and climb to 11,100 meters. Breaking the sound barrier was allowed only above 11,000 meters. The speed then fell to 600 km/h, followed by an acceleration to 1070 km/h for a new climb to reach Mach 2.35 (the most favorable flight mode) and maintain it. Full afterburner could be used continuously for 15 minutes. At around 19,000 meters, afterburner could be reduced to the minimum and that made it possible to attain and maintain to 21,000 meters. Flight duration was 40-45 minutes (increased to 60' under optimal weather conditions and with T-6 fuel). The deceleration phase for the return flight began 200 km from the airbase. Between one and two tons of fuel remained on landing and that was just enough for a go-around.